Looking for the best Rome rooftop bars? 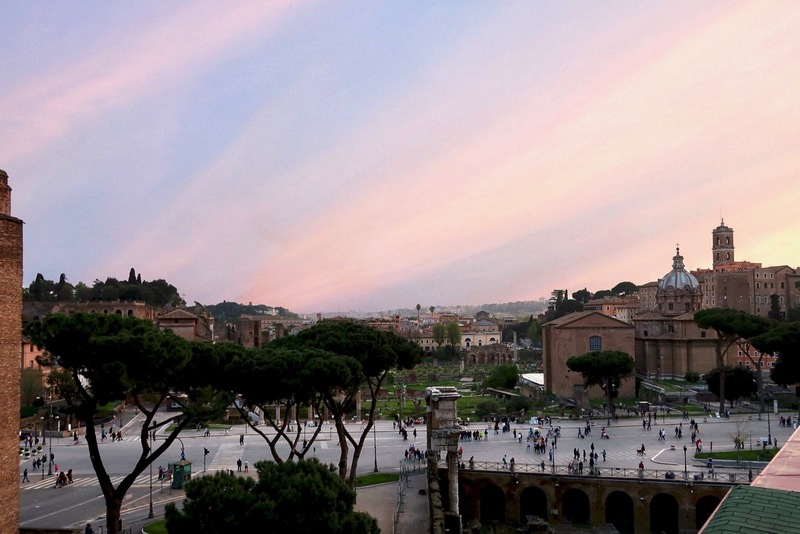 Rome is blessed with a stunning skyline, featuring the iconic outline of St. Peter's dome. And on a day when the sunset looks like this, my favorite place to enjoy a rooftop aperitivo is . . . Check out my top 10 faves (and many more). Plus, get my tips for where to eat afterwards! When I first moved here in 2001, it was not really a "thing" to visit a rooftop bar in Rome. A few of Rome's luxury hotels had rooftop bars, but it was something special to go there. It felt posh and exclusive. 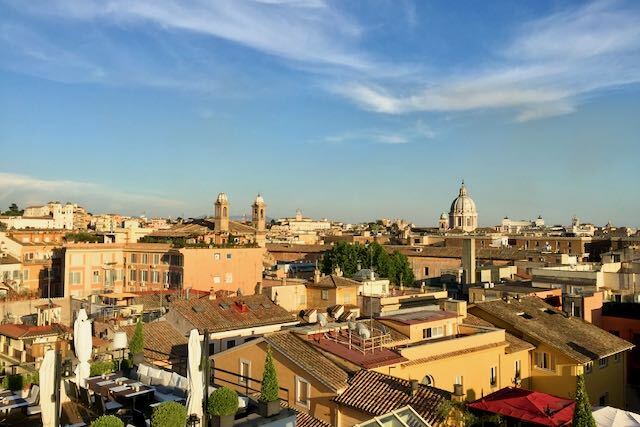 Now, thanks to social media, bloggers, vloggers and guides to Rome (like this one), the interest in visiting a Rome rooftop and having an apertivo overlooking some beautiful Roman vista began to soar. The breathtaking 360 degree views from the Eitch Borromini terrace make this one of the top 10 Rome rooftop bars. Now there are scores of Rome rooftop bars. Some AirB&B's, less fancy hotels, standalone restaurants and even a department store are all jumping on the bandwagon, and we are spoiled for choice. How Do You Rank the Rooftop Bars in Rome? Whether it's to take visiting friends and family, or to meet friends or colleagues for fun and aperitivo, I've done quite a lot of rooftop hopping in Rome. So this page is fully researched by yours truly, and based on my own experiences visiting some fabulous Rome rooftop bars. Now that there are Rome rooftop bars on just about every corner, I can be selective and tell you which are my top 10 favorites. Location - Is it easy to get to, in a nice environment, and easy to find a place to eat nearby afterwards? Also, is it close to other stuff you might want to do in Rome? Easy access - How hard is it to visit without booking in advance, or how hard is it to book at all? What are their opening hours? How much space is dedicated to the bar? The Zen - Although it might seem anathema, sometimes I actually want my rooftop experience to be quiet and mellow. The snacks - This applies to both the complimentary stuff they bring out with your drinks, and to what's available to order. The offerings around Rome rooftop bars are really varied. 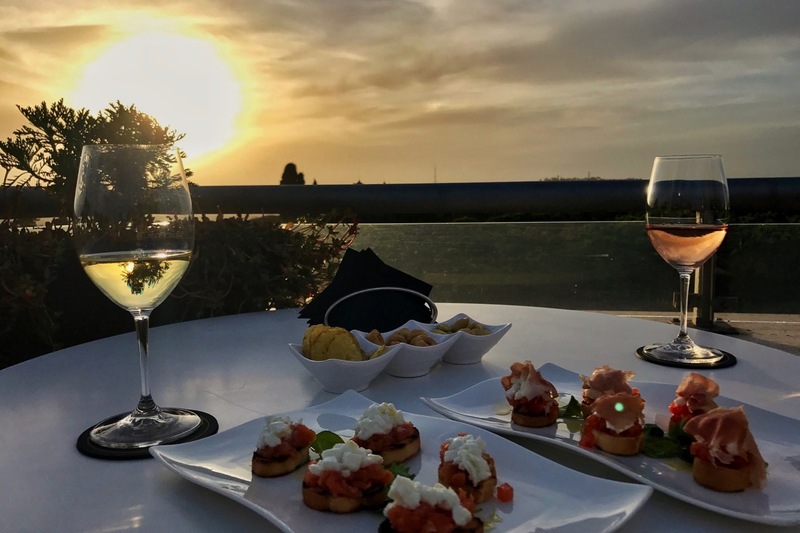 Speaking of snacks, most Rome rooftop bars serve only finger food or otherwise have a limited menu and don't really serve dinner food, so I'm including my recommendations for where to eat dinner near all the places I list on this page. These are my top 10 favorite rooftop bars in Rome. For me, they all offer something special, and I'll tell you why. If you want more choices for Rome rooftop bars, I've listed plenty more below. For a map of the Rome rooftop bars I list here, see the bottom of the page. I can't get enough of this rooftop bar. The sunsets I've seen on the Minerva rooftop bar are some of the most amazing I've ever seen in Rome. I love the big open, welcoming space, the WOW (this one is big on the "wow"), the sunsets from here, and the friendly yet professional waitstaff. There is nothing like seeing the Pantheon from this angle, and this up close and personal! That's why the Minerva rooftop bar is one of my all-time favorites in Rome. From one side you can gaze at the roof of the Pantheon. From the other, you can sit at the bar and look out over a sea of Roman rooftops. The views from the Hotel Minerva rooftop bar are spectacular no matter where you sit. This is the view if you sit along the bar. The rainbow is just a bonus. To eat a real meal here, you'll have to go to the restaurant inside (which I've never done). I have wound up eating plenty of aperitivo snacks to wind up not needing a meal afterward, but if you do want to go elsewhere, you are right near many of my favorite Rome restaurants near the Pantheon, like Armando (book days in advance), Del Sostegno, and Pizzeria Emma. If you go before peak happy hour time (7-8pm), you almost always find a seat with a view, even when you just show up. The Minerva is a 5* luxury hotel, and their roof is a magnet for weddings and other special events, so you might find it wholly or partially closed to the public (it's a really big space, so often, even if there is an event, they only take up part of the terrace). Either call ahead to be sure it's open to the public, or have a backup plan. Details: Piazza della Minerva, 69. Tel: 06 695201. Open daily noon - 1am. Reservations suggested for peak cocktail hours. This one is all about the Wow. There is no other rooftop bar like this anywhere in Rome. This was an actual sunset one evening, as seen from one of the most central Rome rooftop bars, the Eitch Borromini. Can you believe these colors? You have a wide-open rooftop, with 360 degree views. Looking down on Piazza Navona from the Eitch Borromini terrace is one of my favorite things about this bar. But not just any view - you can see church domes, the Pantheon, Piazza Navona below you and, of course, the iconic St. Peter's dome off to the back. With wide-open skies and an unobstructed view of St. Peter's dome, you get some pretty spectacular sunsets up on this roof. It makes for a stunning setting to enjoy drinks and a sunset. Did I mention you are sitting right next to the dome and bell towers of Borromini's church, Sant'Agnese in Agone? Right up close to Borromini's church Sant'Agnese in Agone. They get high marks from me for the free snacks, which are healthy, light, and partly vegetarian (wild rice with chick peas, or couscous with shrimp, for example). They also have a pretty good bar menu with some raw fish and some limited cooked items. Nice healthy snacks come with your drinks at the Eitch Borromini. The hotel does have a restaurant on the 5th floor (one floor down from the terrace), with amazing views of Borromini's church dome, and Piazza Navona below. Dinner with a view - of Piazza Navona, Bernini's fountain in the middle, and this ancient Roman obelisk. After aperitivo on this stunning terrace (usually after the sunset which is the big reason to come here), we always go elsewhere to eat nearby, usually to Pizzeria Emma, Grappolo D'Oro, or Cul de Sac. This is one of the best Rome rooftop bars with a vibe - it's always packed and the ambiance is convivial, as people move around to take photos from all angles. They also have pop music playing, to create even more of a buzz. And, if you like, you can even attend a concert here! They don't open until 7 pm (although it seems sometimes they open at 6:30 pm). On some levels this makes sense, since they don't have any umbrellas and in the hottest summer months, you would not want to head up before 7pm anyway. Also, it's become such a hot ticket, you cannot just go on a whim. It's always fully booked, so you need to reserve in advance. Sometimes you can book same day, but if you can, book 1-2 days in advance to be safe. Details: Via di Santa Maria dell'Anima, 30. Tel: 06 686 1425. Reservations A MUST. Open daily (in season, i.e. from April - October) from 6:30 or 7pm until 1am. Most of my favorite Rome rooftop bars have stunning views involving St. Peter's Basilica. This rooftop bar is in a class by itself, with front-row seats to one of my all-time favorite churches in Rome, Santa Maria Maggiore. This view of the Basilica of Santa Maria Maggiore, from the roof of the Hotel Mecenate Palace, is one of the most stunning in Rome. This is another one of the Rome rooftop bars that's tops in the "Wow" department. But they also get a lot of kudos from me for their friendly service, reasonable prices, and easy accessibility (you don't need to reserve, they open at 5pm, and there is pretty much always a spot with a view). These are the perfect seats to enjoy this amazing view of Santa Maria Maggiore. The free snacks are basic but nice and carby (mini-bruschette and pizzette), but you can order some other limited light items from their restaurant dinner menu, such as the simple Roman pastas, and some salads. To have a full meal, you'll need to go to the restaurant on the same floor. They serve some basic nice snacks when you order drinks at the Terrazza dei Papi. You can order a few other (limited) items from the dinner menu. Details: Mecenate Palace Hotel, Via Carlo Alberto, 3. Open daily in season from 5pm - midnight. Reservations for drinks not necessary. This is one of my top five favorite Rome rooftop bars mostly because this is where we had our wedding reception in 1999. The close-up view of Saint Peter's basilica, along with a spectacular sunset, make this bar one of the most beautiful places in Rome to have aperitivo. I love it for the gorgeous views. They have a tippy-top-roof with plenty of seating, but with no shelter. They also have another terrace one level down, with awnings. So when it rains, you can still watch the sunset and wait for the rainbow. Caught in a rain shower, you can still enjoy your aperitivo with a view, including a view of the rain. There's an awning, so you're covered. Their complimentary snacks are quite good, and include hot little pizzas. It's been years since I ate here for our wedding dinner, so I can't speak to the quality of the restaurant, although I am sure it's good. If it was me, I'd head to one of the restaurants on my list of places to eat near the Vatican. Thanks to my friend Joanne, I also recently discovered this amazing seafood spot nearby, Da Benito e Gilberto. I love getting a hot little pizza with my drinks at Les Etoiles. Definitely one of the better Rome rooftop bars where complimentary snacks are concerned! Details: Via Giovanni Vitelleschi, 34. Tel: 06 6873233. Open daily from 10am - 1am for lunch, cocktails, and dinner. Reservations suggested. This is one of my favorite Rome rooftop bars for the zen, and for the location. It's got a prime address between the Trevi Fountain and the Pantheon, yet if you didn't know it was there, you would miss it entirely. The entrance to the hotel looks like a basic glass door to a pretty average-looking, small hotel lobby. I love this quiet and sweet rooftop bar and it's lovely view of the facade of Saint Ignatius church. Take the elevator to the top, climb just a few more stairs, and you get a lovely, spacious rooftop, that's well divided into areas with different views. 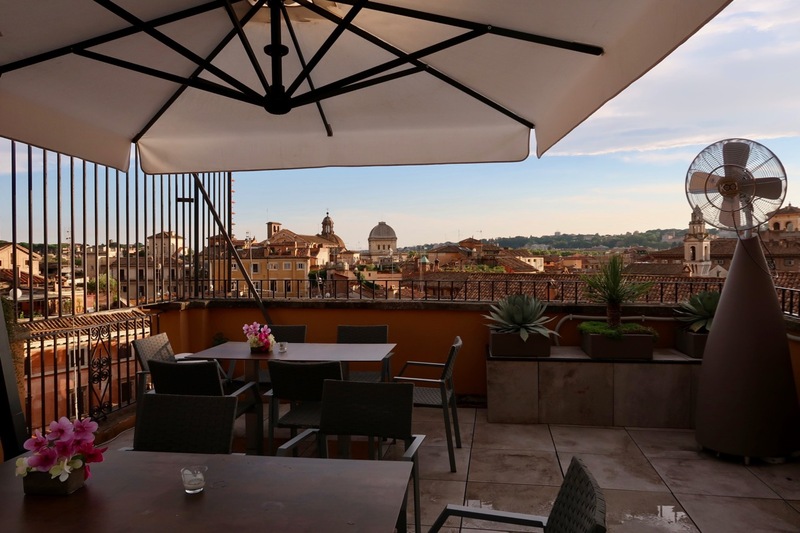 At the 9 Hotel dei Cesari, there are comfy places to sit in different spots all around the roof, making for varied viewing, and a more intimate feel than some of the Rome rooftop bars that are more wide-open. A central bar with hip, friendly, mixologists finishes the ambiance perfectly. The cocktail bar is right in the center of the roof at the Hotel Cesari. Although none of the views are super-wow, I do love the view in the back, from where you can see the facade of one of my favorite churches in Rome, St. Ignatius. There are limited snack options during aperitivo at the Hotel Cesari, but I love the sweet views and cozy ambiance. The one thing sorely missing is a decent food/appetizer menu. They barely have any free snacks but have always been friendly about bringing some small foccaccia and potato chips. So you will definitely need to go elsewhere to eat. And in this part of town, you are spoiled for choice. Check my pages for Where to Eat Near the Pantheon and Where to Eat Near the Trevi Fountain for ideas. I'd personally go to Del Sostegno, Armando or Piccolo Arancio. Don't forget to book ahead! Details: Via di Pietra 89/A. Tel: +39 06 6749701. Open daily 6pm - midnight. Reservations not necessary. This rooftop bar gets my vote for the location. Being this close to Michelangelo's dome? Priceless! I'll take any chance I can to see Michelangelo's beautiful dome up close. And at the rooftop bar of the Residenza Paolo VI, I can enjoy the dome and a cocktail together! But I also love it for the zen. It's mellow and relaxing up on this roof, and I love the feeling of being in a kind of secret spot that not many people seem to know about. And to the right, you can see and smell jasmine, not to mention getting a birds' eye view of Bernini's colonnade wrapping around St. Peter's Square. To get here, go to the left-hand side of Bernini's colonnade, outside St. Peter's Square. You will see a small outside foyer that leads to a closed door. Ring the bell there for "Residenza Paolo VI". It's actually a hotel, and it's owned by the Vatican. But anyone can come have a drink in their rooftop bar. You just have to know it's there. Thanks once again to my friend Joanne, of Travel Angel, for turning me on to this amazing spot. Don't you love this up-close view of St. Peter's Basilica from the Residenza Paolo VI? The photos I took were all outside, however, you can really just go outside to snap photos and enjoy the view. The bar tables are all inside, although often the windows are open. But it's still a wonderful view from there, and a lovely experience. To eat nearby, check my page about Where to Eat Near the Vatican. Personally, I'd head to Sorpasso. Details: Via Paolo VI. Tel: 06 68487550. Open daily from 4pm - midnight. Reservations not necessary. I also love that it's right near the Colosseum and Roman Forum, which makes it a great spot for a rooftop aperitivo after some intense sight-seeing. There is no view of the Colosseum, but the views of Fori Imperiali are fantastic! For places to eat nearby, you have tons of choices. Check my page about Where to Eat Near the Colosseum. Many would suggest the La Taverna dei Fori Imperiali, almost literally next door to this hotel. If you go, make sure to book days in advance. I personally would go to Brocoletti or Alle Carrette pizza. Details: Via Tor de’ Conti, 25. Tel: 06.67.92.446. Open daily from March - October (call to see if they are open if you are in Rome in March or October.) from 11am until late in the evening. There are heat lamps for the cooler months. 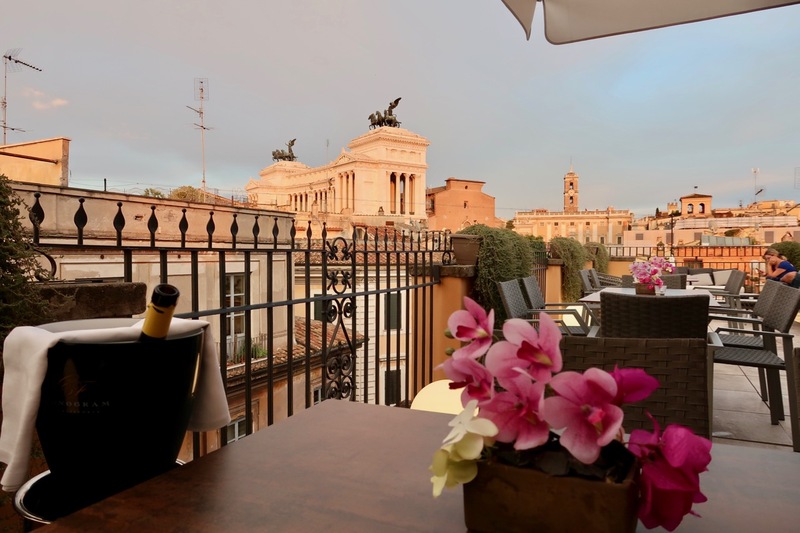 This relatively new Rome hotel is in my top 10 Rome rooftop bars for one main reason - there is a front-and-center view of Campidoglio and the Complesso Vittoriano (otherwise known as the "wedding cake"). Drinks with a view at the Hotel Otium near Rome's Capitoline Hill. The rooftop bar opened in April 2018, and I found out about it thanks to my tour guide friend Elena, of Sognare Roma. It's not a large rooftop, but it's comfortable, and best of all, it's got plenty of umbrellas and places to sit. On one recent visit, it began to rain, so we moved from the view closest to the edge, to one under an umbrella, which was still really nice. It's in my top ten list of Rome Rooftop Bars for the unique view. I also love the umbrellas and the very friendly service. Unfortunately, their snack situation is pretty limited. To olives. Seriously. I hope their snack offerings will improve. In the meantime, you will definitely need to go elsewhere to eat. I would personally go to Pizzeria Emma in Campo dei Fiori, or Nonna Betta in the Jewish Ghetto. Both should be booked in advance. Details: Via d'Aracoeli 11. Tel: +39 0640410547. Open daily HOURS . Reservations suggested. If you're looking for Rome rooftop bars with a view, a vibe, great music and superb food, Zuma is IT. Love the vibe and the views from Zuma, but their aperitivo options for eating are some of the best of the Rome rooftp bars! Perched on top of Rome's Fendi flagship store, right near the Spanish Steps, Zuma has become a magnet for the young, hip, sushi-loving crowd. They have the best ambient music of all the Rome Rooftop Bars (most have none at all), and by far the best food (as long as you like sushi, or at least Japanese-inspired cuisine). The views are wonderful and unique - a peak at the top of the Spanish Steps (Trinità dei Monti), a very cool building from 1900 right next door, and a stunning baroque dome that makes for a killer sunset. Details: Via della Fontanella di Borghese, 48. Tel: 06 9926 6622. Open daily. For lunch, you can go to the restaurant inside. For aperitivo outside, the terrace is open from 6pm - 1am (until 2am Friday and Saturday), while the restaurant is open from 7pm - 11pm. This is actually my top favorite of all the Rome rooftop bars. Look at this view! So why is it down here at number 10? Because when I went to check their hours and contact details, I saw a note on their website that said "Total refurbishment, reopening March 2019". So until then, I don't want to go on and on about them too much, and disappoint you when you find you cannot go in 2018. Stay tuned. I will be updating this page for the rooftop season beginning in spring 2019. Details: Via Lombardia, 47. Tel: +39 06 478021. Reservations suggested. Open daily from 11am - midnight. I love the bar on the top of Castel Sant'Angelo for one thing and one thing only - the view. It's a wow. It's not one of your typical Rome rooftop bars, because most of the time, the bar closes at 7:30pm, when the castle itself closes (the exception to this is in summer on weekends, when the castle is open late for visit, and then so is the cafe). Also, since it's inside a monument, you need to pay (14€) to get in (unless you come on the free Sunday, which is the first Sunday of every month). The castle is part of the Roma Pass. But it's still got that wow, so it's on my list. Pretty substantial snacks (to order), and friendly service round out the plusses here. I really like this rooftop, and would probably even put it in my top ten list of Rome Rooftop Bars, except that most of the 2018 season, every time I called to check/book, they have been renovating this roof. They are supposed to open mid-September. So, I'll write more about them once they actually re-open. Stay tuned. I have a soft spot for the roof of this hotel, because it was one of the first fabulous Rome rooftop bars to open in Rome and the one I came to the most before so many others opened. You'll get nice views of the ancient Roman temples along the Tiber if you sit near the edge or lean over, and you can also gaze upon the church of Santa Maria in Cosmedin. The snacks are pretty good, but the service can be spotty. It's fairly close to some of the main tourist attractions like the Jewish Ghetto, the Mouth of Truth, and the Circus Maximus. To eat nearby, I'd suggest heading into the Jewish Ghetto and trying Nonna Betta or Beppe e i Suoi Formaggi. Details: Via Luigi Petroselli, 47. Tel: 06 678 7816. Open daily noon -midnight. Reservations for drinks not necessary. While this rooftop is destined more for their restaurant, the limited bar space does offer gorgeous rooftop views and a romantic atmosphere. Details: Largo Febo, 2. 06 9480 6631. Open daily 12pm - 10pm. It's not possible to book the bar tables, but you can book for dinner. The newly-opened flagship store of Rinascente right in the center of Rome has caused a big splash. It's got everything you could want in a modern, urban, hip shopping venue - all the best brands, a gorgeous, airy, open-space design, Roman ruins in the basement, and a rooftop bar. What? Roman ruins in the basement? Well, maybe that's not something you find in every shopping center. So let's say that's one thing that makes this Rinascente so incredibly special (and by the way, there is a bar down there, too, so you can enjoy an aperitivo with your archeological visit). But head all the way to the roof, and you've got a lovely spot to enjoy an aperitivo, complete with beautiful views and a fairly good appetizer menu. It's a bit of a bustle up there with people coming and going, and moving around to get photos of the rooftops and sunset. Details: Via del Tritone, 61 and Via dei Due Macelli, 23. Tel: 06 879161. Open daily all day until 11pm. You can have drinks right on/above the Spanish Steps, with a view mostly of the Steps themselves. Don't expect dinner here, but you can order some pretty nice snacks. The sunsets can be amazing! Details: Top of the Spanish Steps. Vicolo del Bottino, 8. Tel: 06 6993 4560. Open only in season, daily 4-10pm. In researching Rome rooftop bars for this page, I went around to the various Michelin starred restaurants that happen to also be on top of luxury hotels. At these places (below), you will be treated to a phenomenal view if you dine there. I believe that because they dedicate this view to their restaurant goers, these places are less inclined to have a real rooftop bar, let alone with a view, for just drinks/aperitivo. There are lots of Rome rooftop bars where you'll come for the ambiance but not so much for the view. I love all these rooftops, and think they offer something special too. They can be an excellent alternative to some of the ones I list above, if you are looking to simply enjoy eating and drinking outside, but away from traffic and street-vendors. They are also great choices if you are staying at these hotels, or nearby, or if you want a pool. The Corner is a lovely rooftop with separate spaces for drinks and for dining, and the 1* Michelin restaurant is excellent. It's also a pretty romantic place to eat or drink, due to the beautiful mix of flower-filled trellises, cozy garden furniture and gazebo-like gathering spots dotting the rooftop. Details: Viale Aventino, 121. Tel: 06 4554 8810. Monday - Saturday 6pm - 2am. Closed Sunday. Hotel Victoria near via Veneto. They have a beautiful flower-filled rooftop. Details: Via Campania, 41. Tel: 06 423701. Open daily. Hotel Aleph near via Veneto. There is a lovely rooftop bar, complete with pool and comfy, chic furniture. Radisson Blu Zest Bar near Termini station. There is a stunning rooftop pool and two places to eat on the 7th (top) floor, but only one of the restaurants serves drinks (Zest Bar), and it's not overlooking the pool. Palazzo Naiadi, formerly known as the Hotel Exedra, in Piazza della Repubblica. They have a gorgeous rooftop bar, and some tables inside that overlook the pool. You will see some rooftops and part of Piazza Exedra when you have a drink there. Details: Piazza della Repubblica, 47. Tel: 06 489381. Open daily 6pm - midnight. I eat here often for lunch, and there is an outside that has both a covered part and a completely un-covered part. So you can have drinks on the roof, and there is a bit of a view if you go to the very top. There are some rooftop bars in Rome that you can only visit if you are a guest of the hotel, or are planning an event there. Want Even More Rome Rooftop Bars? While researching for this page, I came across an interesting site, The Rooftop Guide. This is really cool. These two Swedish guys have been building this amazing resource that gives you a super guide to rooftops around the world, from rooftop bars to restaurants to pools and more. Check them out here. Also, my friend Livia Hengel just published her own map of Rome Rooftop Bars, in which you can see just about every rooftop bar in Rome there is. Return to the top of Rome Rooftop Bars.